The Giles Modular Tactical Sling uses interchangeable front and rear attachment adapters allowing you to build a sling to fit your weapon today, and rebuild it to continue giving service in future configurations. The evolution of AR-15/M16-series weapons, and the introduction of many new rifles and shotguns, has been remarkably dynamic in the past ten years. However, as shooters and operators have upgraded their rifles they have often changed buttstock and forend dimensions, or even changed the attachment system completely. In 1985 when we developed the modern tactical sling (the Giles Tactical Sling) we began with the Steyr AUG which was a rather simple proposition because it was set up for side mounts. The AUG sling has proven to be an incredibly adaptable foundation and is the basis for all of our tactical slings except the Single-Point Sling. The next move was to fit the Giles Sling to M16/AR-15 pattern carbines. To do this we carefully designed adapter harnesses for the front and rear of the weapons. These wraparound harnesses enabled us to side-mount the Giles Slings because bottom mounts would allow the rifle to flip upside down. The harnesses are fitted with a tab which attaches to the bottom sling swivels to prevent the harnesses from sliding to the upside down position. In the past we have hard-sewn the front sling harness to the sling, which is an excellent arrangement and works exceedingly well. Now there is an alternative: the Giles Modular Tactical Sling. We sew a loop lock to the front and rear harnesses which act as side-swivel attachment points for our basic Giles Sling body. Making them removable and replaceable means that you change your forend or buttstock adapter harnesses to match your hardware. The choice is yours: the simple, hard-sewn original Giles Tactical Sling if you intend to keep your weapon as-is, or the Giles Modular Tactical Sling if you might change its configuration. 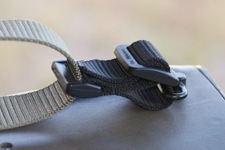 The Quick-Fit Sling Adapter adds a buckle assembly to the rear of the Giles Tactical Sling for fast and easy attachment to any 1¼" slot or side-swivel. It eliminates the need to disassemble the sling to install it on the weapon. As an added benefit on AR-15/M16-series weapons, when using a Single-Point plate as the rear sling attachment point the Quick-Fit Adapter also adds standoff for accessing the weapon's selector switch and bolt release more easily. Compatible with all Giles Modular Tactical Slings, the standard Steyr AUG Giles Sling and the Dual Tri-Glide Giles Sling. We highly recommend this adapter due to the simplicity of attachment to the weapon. If ordered, it will come already assembled on your sling. Your Giles Modular Tactical Sling will come pre-assembled for your convenience. While your included instruction sheet may indicate it is for a different model of firearm, the directions should be correct for your specific configuration as well.